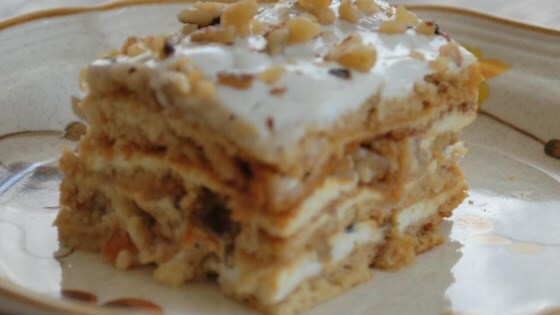 "It's one of the most popular Latvian cakes  simple and delicious! It requires a little work but it's definitely worth it! I've made it several times and my preparation skills are improving with every time. Don't get scared away because of the sour cream, it matches perfectly with the sweet honey taste. The cake tastes the best after it's kept overnight in the refrigerator, the flavors will blend together nicely. I use a 9x13 inch baking pan, but another similar size will do." Mix together eggs, honey, flour, and baking soda in a large bowl. Spoon 3 to 4 tablespoons of batter onto 5 9x13-inch sheets of parchment paper. Spread the mixture as thin as possible using a wide spatula. There is enough batter for 5 thin layers. Place one sheet of batter onto a baking pan and bake in the preheated oven until golden brown, about 2 to 3 minutes. Remove the baked cake layer from the baking sheet and prick with a fork to enhance filling absorbency. Repeat with the remaining 4 cake layers. Stir together the sour cream and sugar in a small bowl. Place one cake layer in 9x13-inch baking dish with the parchment paper side up. Carefully remove the parchment paper from the cake layer. Spread 1/5th of the sour cream mixture on the cake layer and then sprinkle 1/5th of the walnuts on the layer. Repeat the process with the remaining 4 layers. Cover and refrigerate overnight. Trim off any ragged edges before serving. Hi, I dont know it cake is Latvian, but we in Lithuania making same, only to filling we add fresh 1 lemon juice. Try its real good!!! Latvians know how to do an amazing cake! Good for breakfast lunch or dinner- Oh and dessert too!